Full colour process digital print is subject to a £30 setup charge. 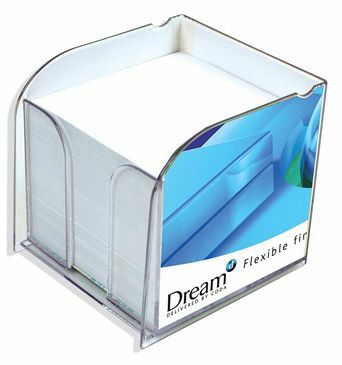 Stunningly crafted, this new range of clear acrylic memo block pad holders feature a card insert sheet that can be printed in up to full process colour, offering exceptional branding and design flexibility. Each holder contains a block of approximately 800 sheets of quality white offset paper. This wonderful promotional giveaway is guaranteed to bring success to your promotional campaign.